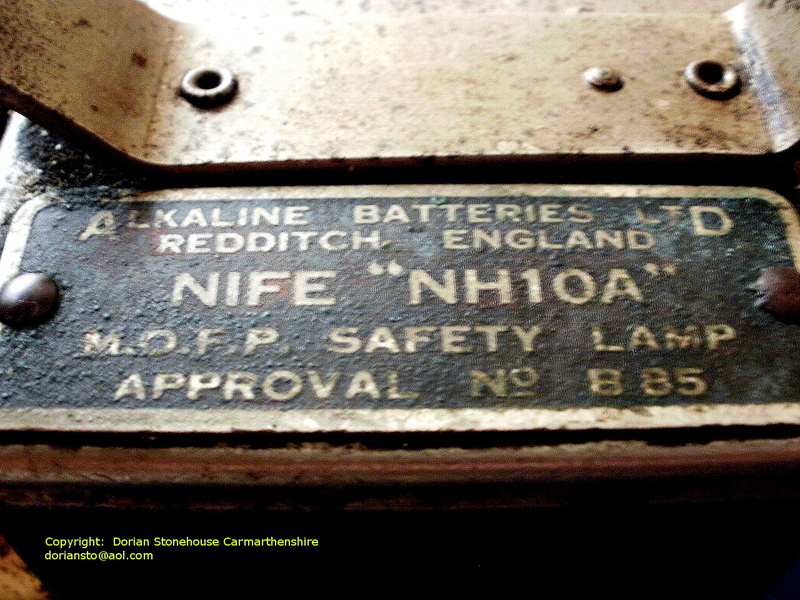 Alkaline Batteries Ltd, Redditch, England. 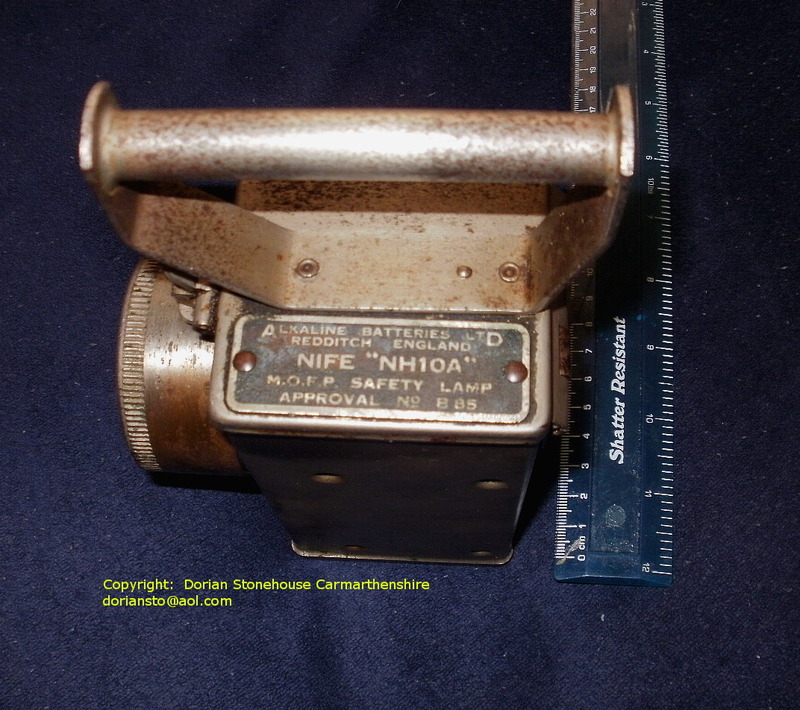 NIFE “NH10A” M.O.F.P Safety Lamp. 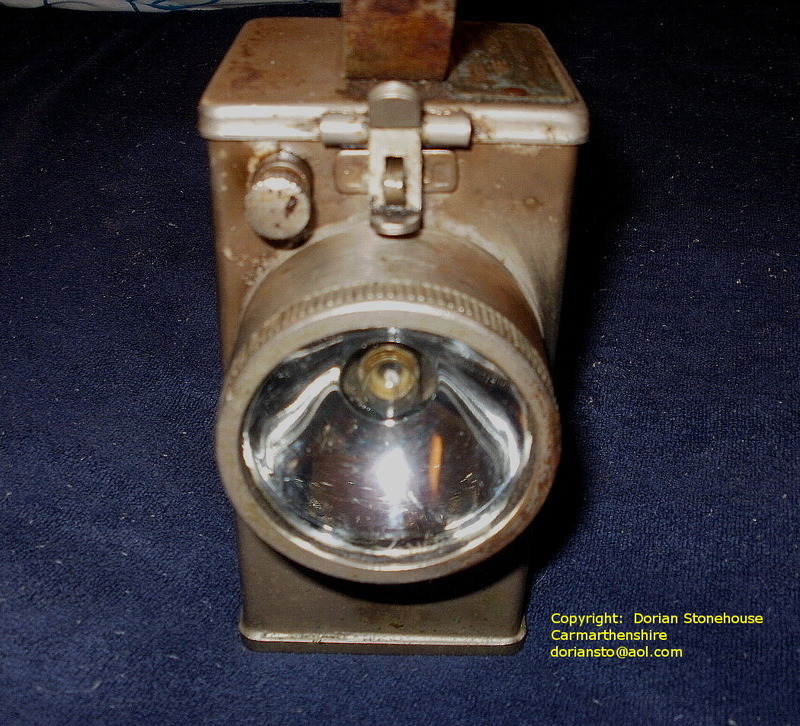 THE little N10A is a lovely little lamp to service, it just needs a bit of TLC – and with a bit of luck, it should, once again, spring back to life. 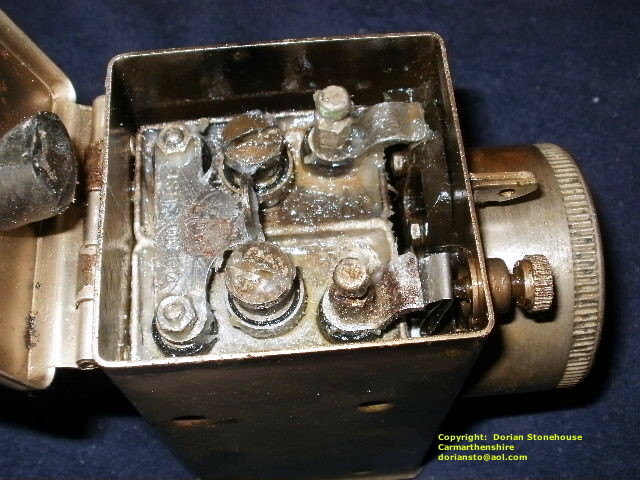 Don’t be put off by the state of the battery box. The above shows what can be accomplished with a little bit of gentle cleaning (more on this later). Is the battery any good? 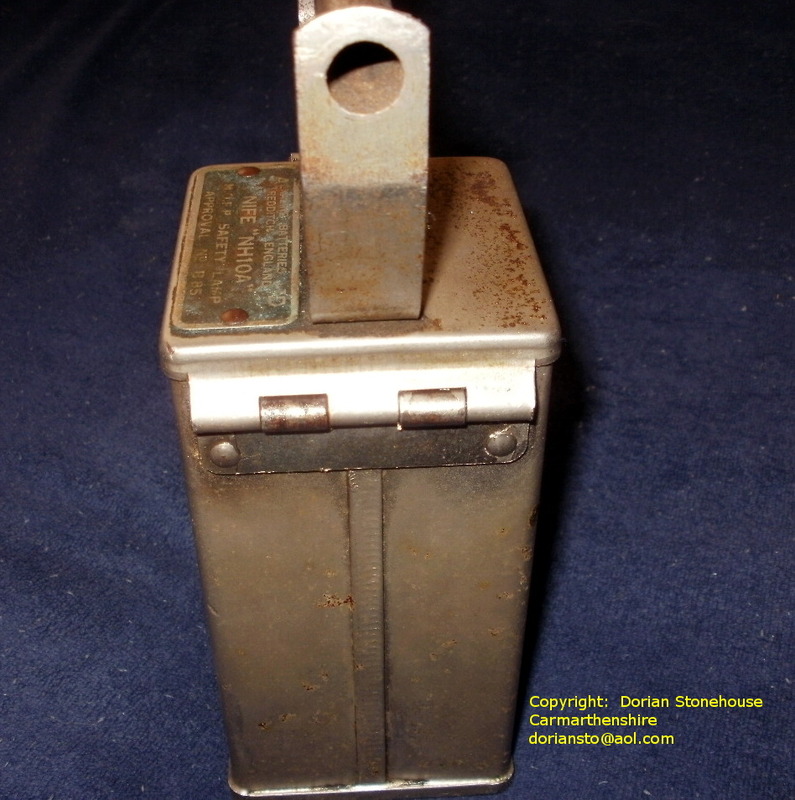 The twin battery pack, with the empty lamp case on the side and the reflector on the right side. 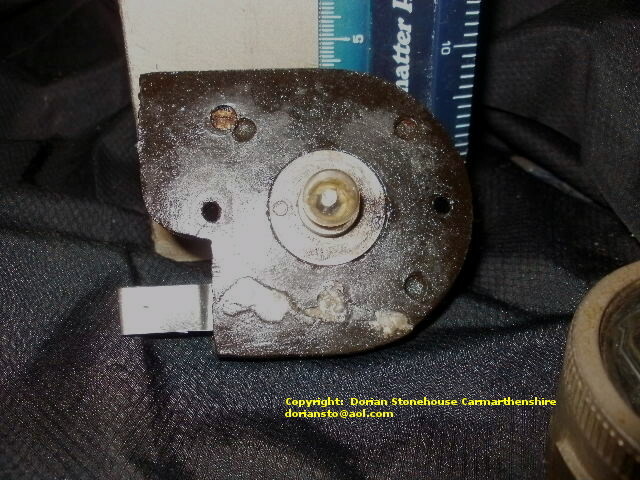 I always attend to the 2.8 volts Edison cells first, by lifting the block out of the box for refurbishment. After all, they are at the heart of the lamp. Therefore, should they turn out to be unserviceable, the rest of the renovation project may not be worth the time and effort? 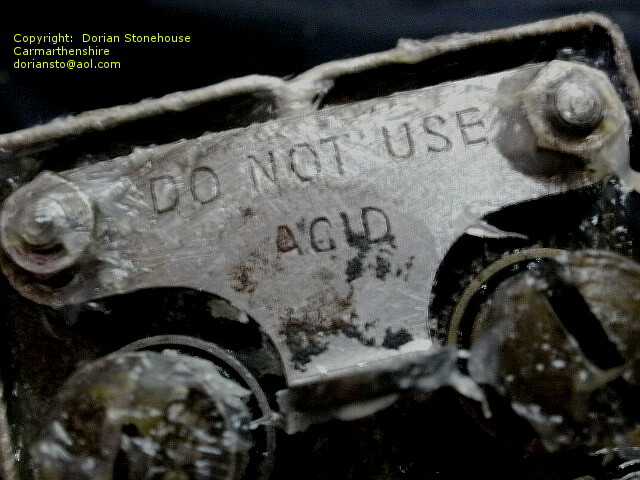 I just take a pair of pliers and grab the protruding metal lip that sits on the plate marked “Do not use acid”, and the cells (which are connected together as one) come out of the box without too much hassle. 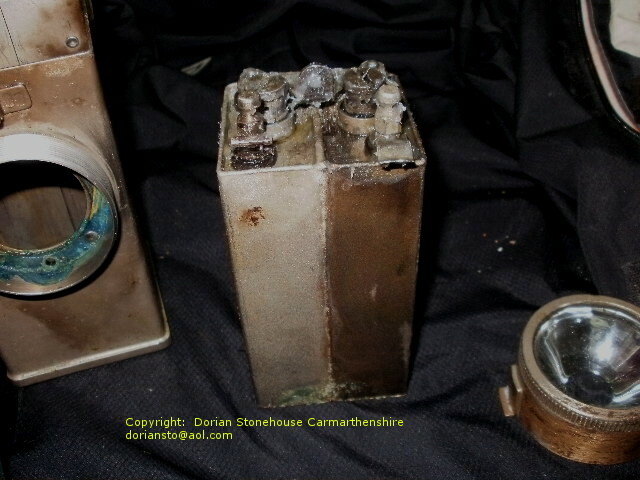 My N10A had been used and abused over the years, before being stored in a shed and left for dead! Therefore, there was a lot of crystallised potassium hydroxide (KOH) stuck to everything. 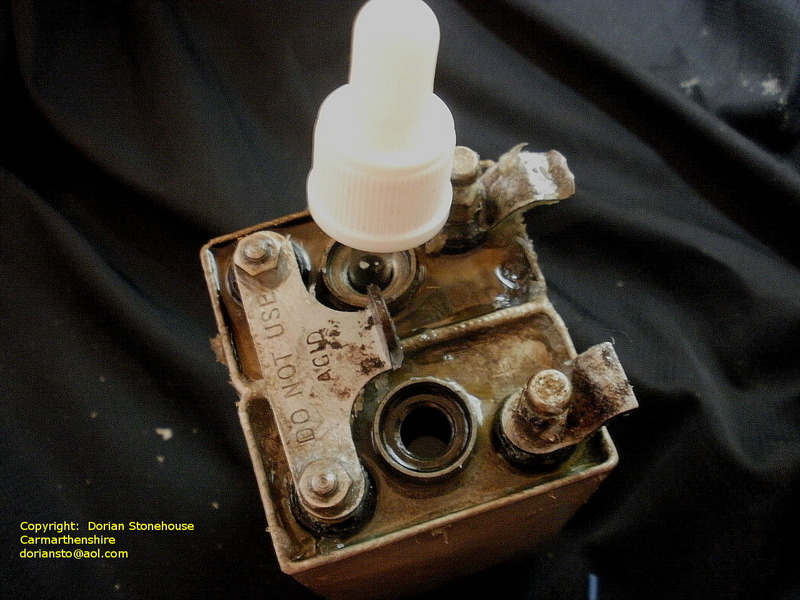 I safely unscrew the cell plugs and wash out and dispose of any old electrolyte and sludge remaining in the cells. Then I rinse the cells several times with clean water, before letting the cells dry off. I proceed to sprinkle potassium hydroxide onto about 250 ml of deionised water, bringing the specific gravity up to around 1.25, stirring as I go with a stainless steel spoon. 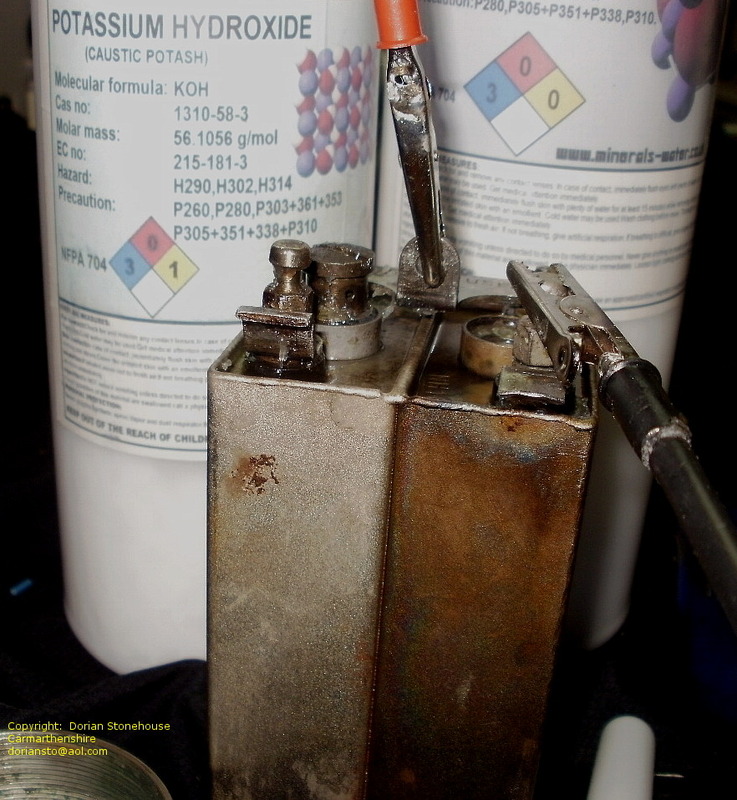 I then sprinkle a teaspoon full of lithium hydroxide (LiOH) into the electrolyte and again stir well. Do not expect perfection: in practice, the lithium hydroxide may not be fully soluble or may take time to reach solubility. But in time, it will increase the charge retention of the cells. 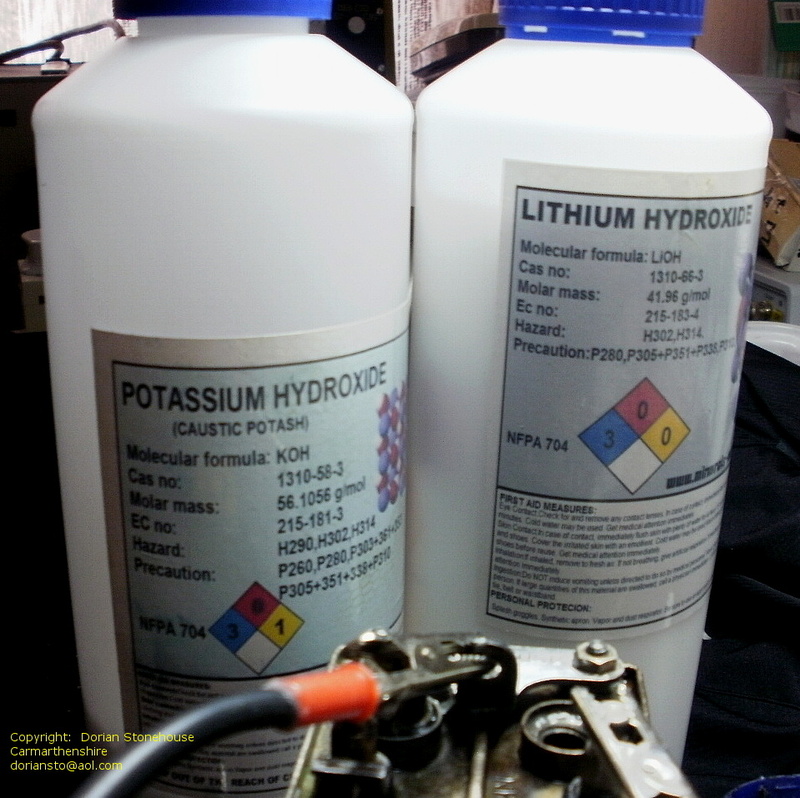 A word of caution: KOH and Lithium hydroxide, give off dangerous fumes. A suitable face mask MUST be worn when handling these chemicals. The work should only be carried out by very experienced personnel – in an extremely well ventilated environment. I allow the electrolyte to cool down, before I pour it into the cells. I find that it is better to charge the cells separately at first⇑⇑. This enables the cells to be equalised before normal charging takes place. I adjust the first cell to be charged to 1.70 volts, and I then observe the current. The current flowing into the cell will be in the region of 3 amps. After a while, the current should begin to fall. I then readjust the current, maintaining the same current. If there is no further reduction in current, I repeat the procedure for the other cell. After a few hours, both cells should settle to 1.4 volts per cell. I proceed to adjust the voltage to 2 x 1.7 volts = 3.4 volts and maintain this voltage across both cells for about 7 hours. A dropper sits on the cells. I allow the cells to fully degas, before mopping up⇑⇑ surplus electrolyte and squirting it back into the cells. Finally, I smear the entire outside top and sides of the cells with plenty of Vaseline⇑⇑. 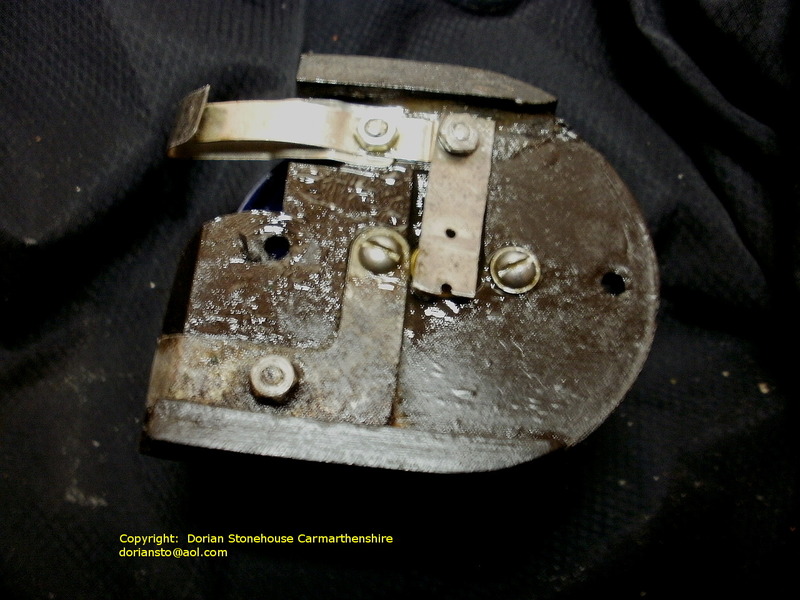 This is essential; otherwise crystals will start to form, entirely silting up the inside of the lamp. 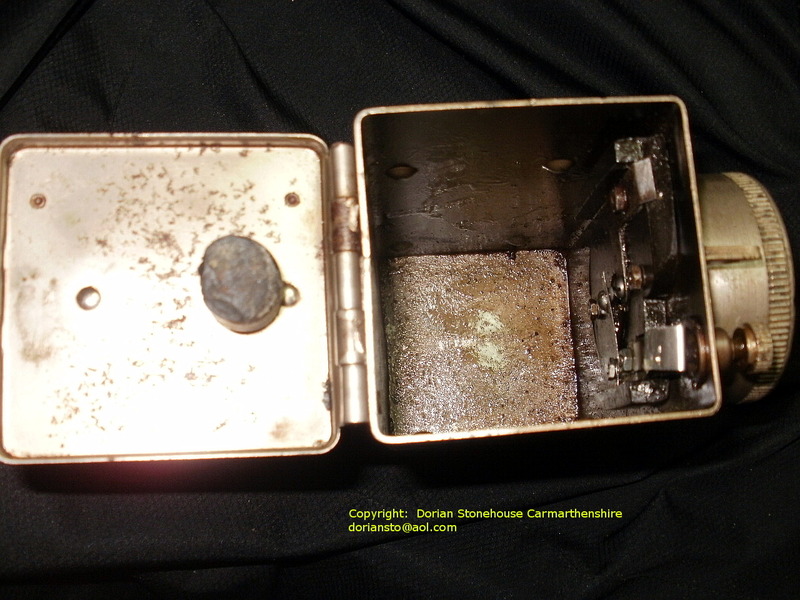 The next job is to give the inside of the box a good flushing under the tap, to get rid of the years of grime and tarnish. A really useful tool for doing this is the humble toothbrush. It took a lot more work before it started to look like this! The outside of the box will probably need a good cleaning as well. 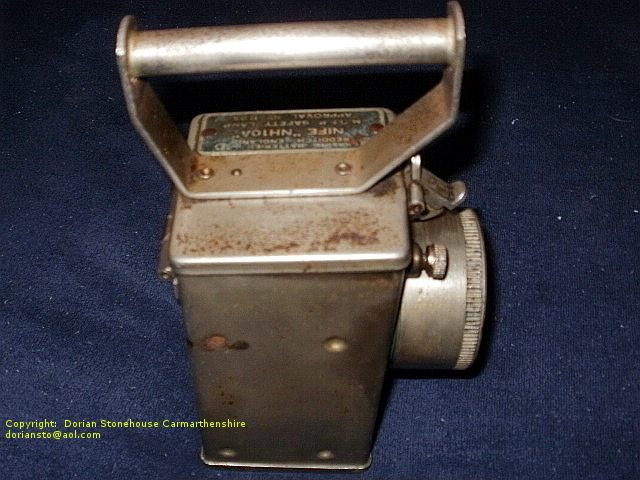 Be careful not to use anything too abrasive for this job, as it could destroy the nickel coating on the box, and hence the lamp’s lovely patina. I circumnavigated the housing by means of an adjustable rubber strap wrench, and managed to unscrew the housing without too much difficulty. 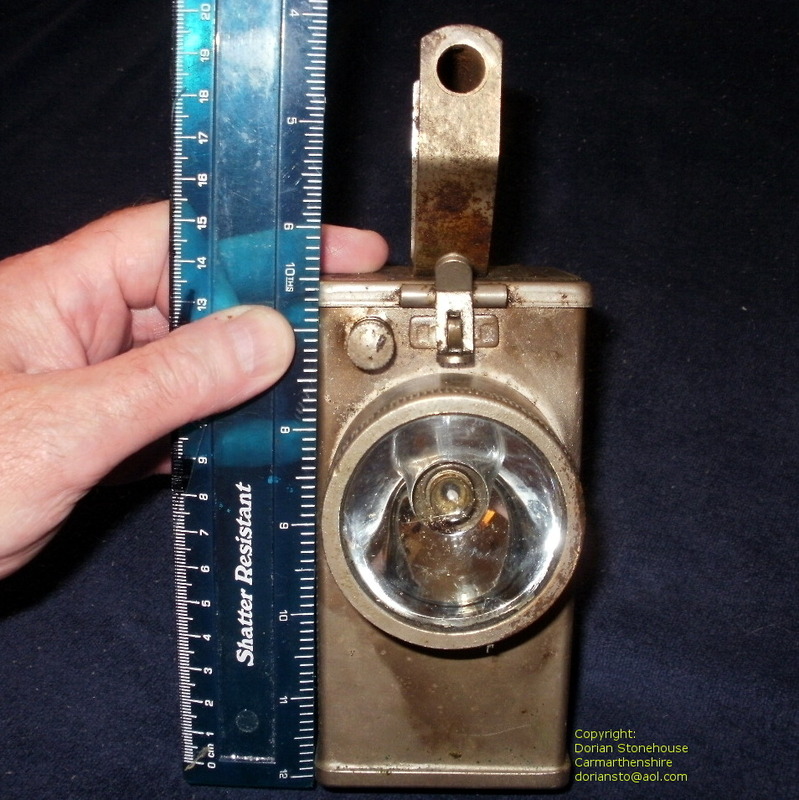 Do not use a chain wrench, as it could easily damage the lamp. 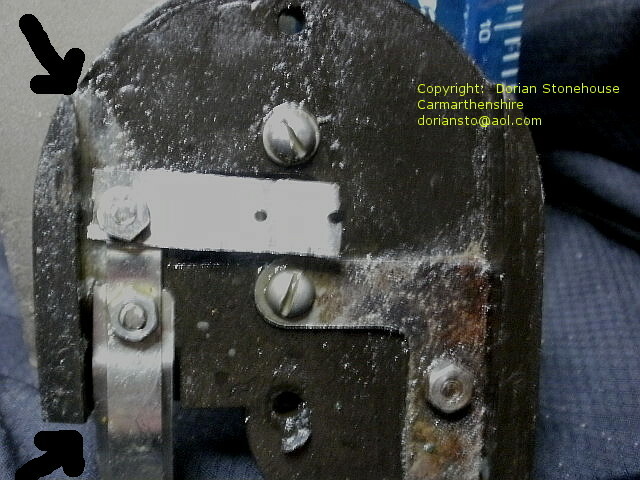 The next task is to remove the two little bolts⇑⇑ under the housing. 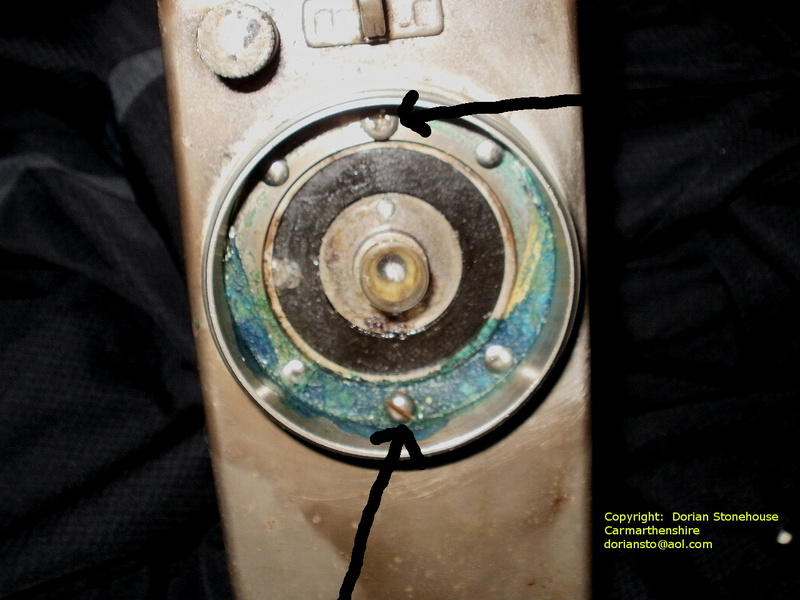 Once removed, the backelite former – the wafer assembly that holds the switch contacts and bulb, can be pushed out and removed for inspection, repair and a bit of a clean-up. Did I kill the goose that laid the golden eggs? 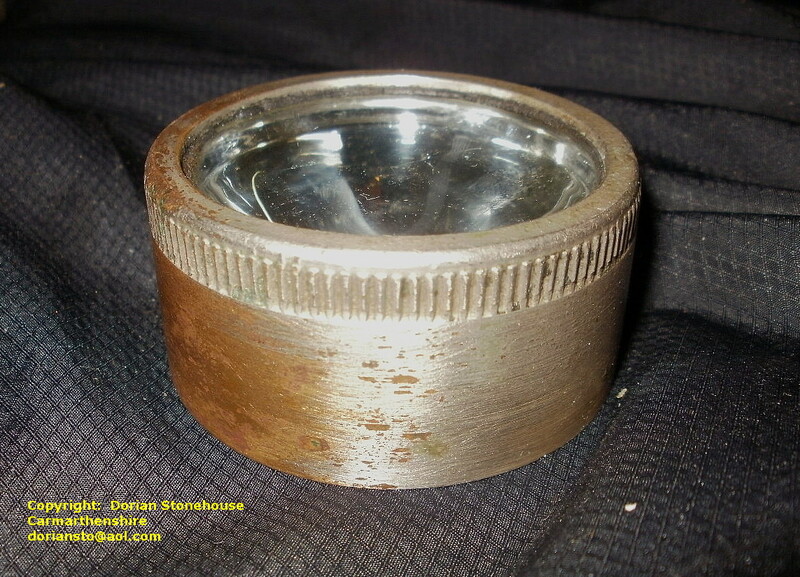 I am not sure if the bakelite former was already cracked⇑⇑ in my N10A; or perhaps I had been a bit too rough with the tooth brush and damaged it myself. 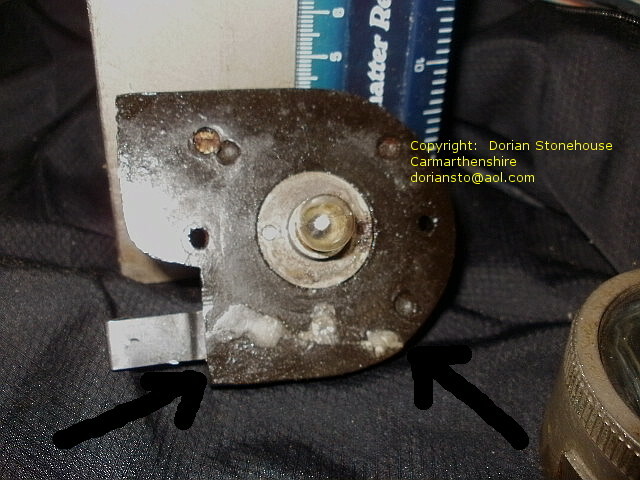 Anyway, this part is fragile due to age, and it came apart as soon as I unscrewed it! To repair the fracture, the best adhesive to use is a “super glue” type of contact adhesive. The two halves should of course be glued, and then joined together. I find that covering the crack with bicarbonate of soda (baking soda, NOT baking powder) revolutionises the repair, by hardening the joint in seconds. 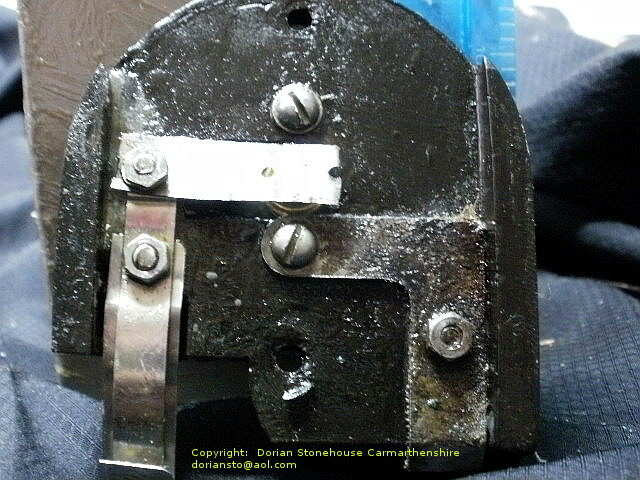 Finally, the whole repair must be clamped together and left for 24 hours, to ensure a permanent cure (but See lacquering⇓⇓). Print circuit lacquer hides a multitude of sins? The former on the bench. 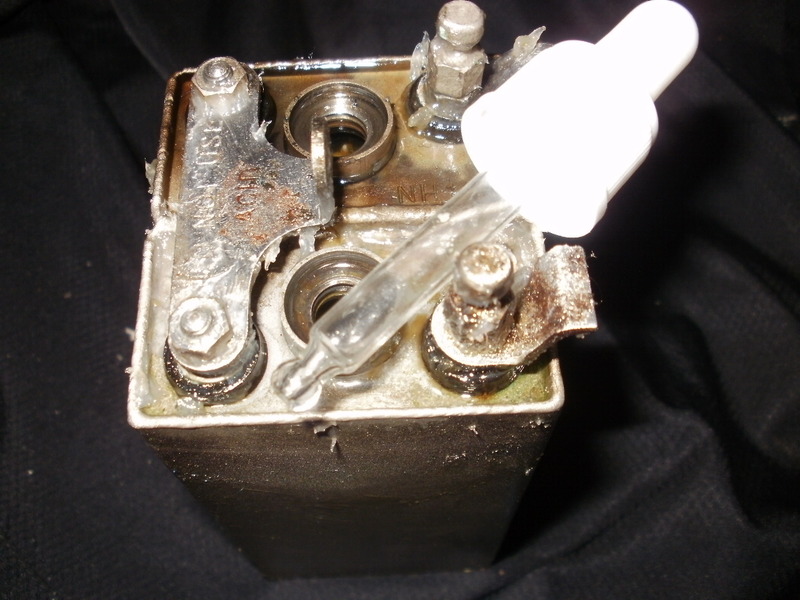 Not only does print circuit lacquer paper over a the cracks, but liberal application also forms a hard alkali barrier that protects the repair against electrolyte spillage. 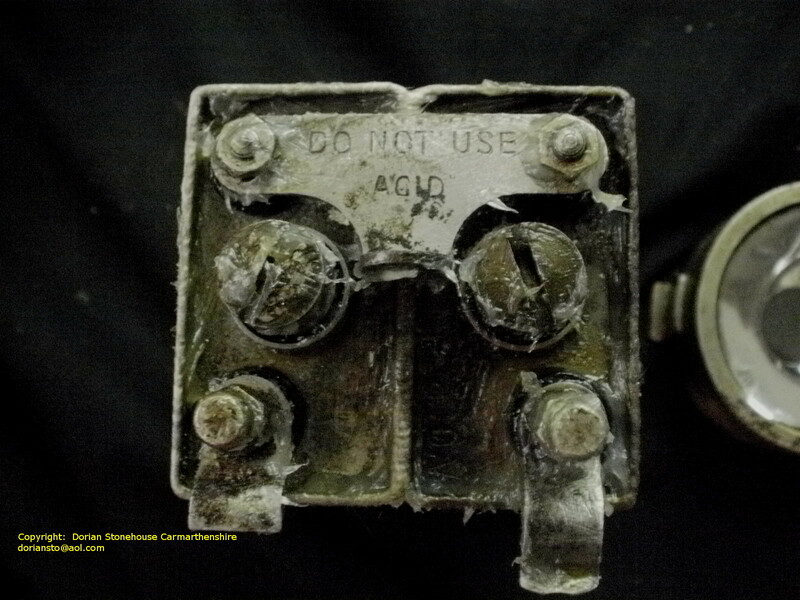 The tempered metal strips which make up the on/off switch are usually badly rusted, so need replacing. This is quite easily accomplished by cannibalising an old torch (flashlight) by removing all the tempered strips necessary, and fixing them as shown on the left hand side of the picture⇑⇑. 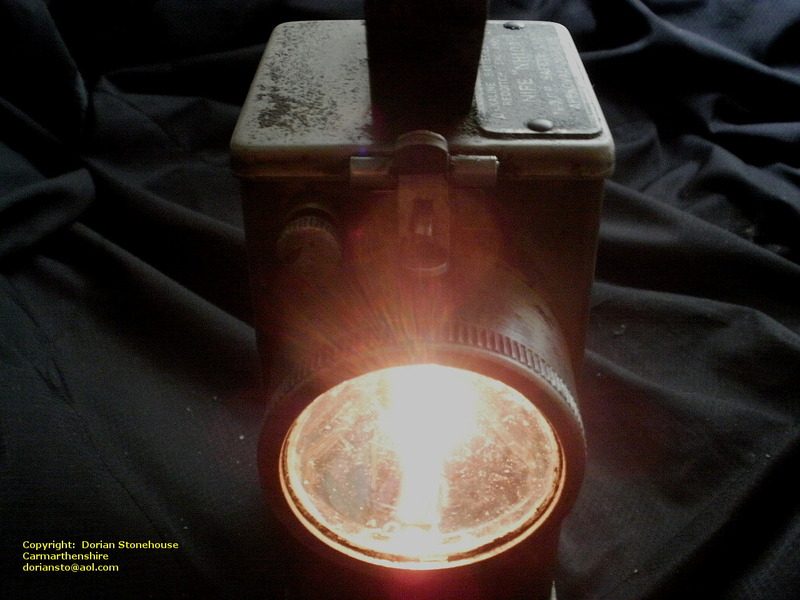 The lamp glows in the dark – job completed. I really hope you have enjoyed my renovation story, and that you might be able to contribute to the website by sending in your technical stories.